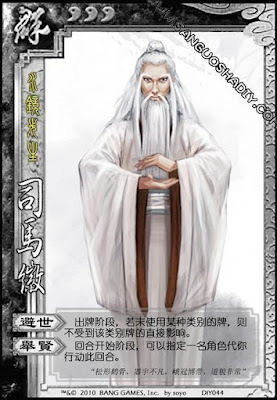 If Sima Hui does not use a type of card during his turn, he cannot be affected by that type of card until his next turn. At the beginning of his turn, Sima Hui can give his turn to any other player. The types of cards are Basic and Tool. If Sima Hui gives his turn to someone, it does not count as him using any cards. After the player completes his turn, the orders resumes with the player to the right of Sima Hui.